Malaku Lorne takes Bahamas' FIDE Event! Jamaica's Malaku Lorne in the heat of battle with Bahamas' Charles Duncombe (right) in the final round of the Providence International. Long-time chess organizer Warren Seymour is standing on the right. Photo by Dahalia Smith. 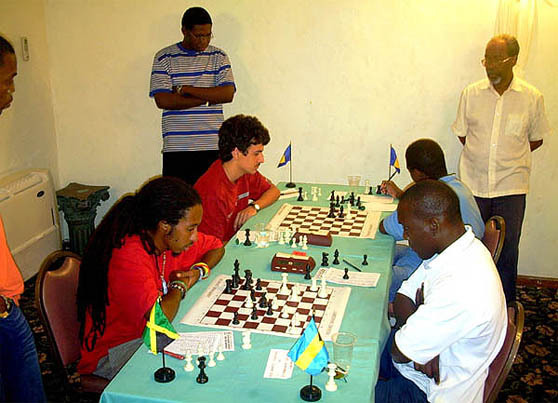 Dahalia Smith, "Jamaican Malaku Lorne Wins World Chess Event," The Bahama Journal, 19 August 2006 (Nassau, Bahamas). Jamaican Malaku Lorne was crowned the overall champion while Bahamian Frank Gibson won the bronze at the New Providence Invitational Chess Tournament (World Chess Federation (FIDE) rated event), hosted by The Bahamas Chess Federation which concluded at the Casuarinas Hotel Thursday. In the ninth and final round, five matches were played. The results saw Martyn Del Castihlo (Barbados) beat Justin Blackman (Barbados) 1-0, Lorne defeat Charles Duncombe (Bahamas) 1-0, Byron Small (Bahamas) win over National Champion Frank Gibson 1-0, Daren Wisdom (Jamaica) overcome Kean Smith (Bahamas)1-0 and National Junior Champion Elton Joseph triumph against Ken Gibson, 1-0. The final point tabulation had Lorne (FIDE rating 2097) win the gold medal with seven and a half points. Del Castihlo (FIDE rating 2113) won the silver with seven points and Wisdom (FIDE rating 1875) and Frank Gibson shared the bronze position with five and a half points each. Finishing fifth with four and a half points was Joseph, Ken Gibson was sixth with four points, Smith was seventh with three and a half points, Blackman (FIDE rating 1984) and Small was eighth with three points and Duncombe was tenth with one and a half points. All of the Bahamian players earned a FIDE rating by winning one point, playing against rated opponents. After the final round was played an awards ceremony was held. The champion, a 21-year old senior at the University of the West Indies, touched on sacrifices made to attend the event. "This is my first time in The Bahamas. Last year at our nationals I finished fourth overall and the year before that I was third. However I did forgo my chance to improve at the nationals. The tourney is going on right now." "Nonetheless I can always play in our nationals but coming here to play is a once in a lifetime experience. The highlight for me was when my countryman beat my closest competitor Castilho, something I was unable to accomplish," explained Lorne. BCF President Kean Smith noted that he was satisfied with the level of play. "We are happy that we were able to host this tournament, the first ever FIDE rated event ever held in The Bahamas. I am also delighted that our players were able to score points, sufficient enough for us to earn ratings." "The highlight of the tournament was when Frank Gibson tied with the highest rated player (Del Castilho) and then in the following round he defeated the second highest (Malaku)," said Smith. 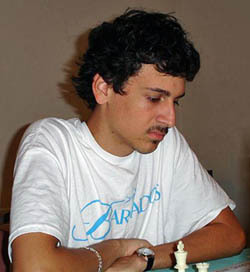 Seventeen-year old Castilho noted that he did not expect for the competition to be so stiff. He added that when he returns to Barbados he would try to take the overall title at the Junior Chess Championships. He finished second last year. FIDE Co-Chairman for technical and financial assistance (Chess Development and Assistance Committee) Alan Herbert, was pleased overall. "It was our pleasure to provide assistance to the BCF and welcome you back into the realm of international chess. The Bahamas and Belize were the only two countries in the Americas region that did not have FIDE rated players. I now have to work on Belize. The tournament was well designed, competitive and I am happy with what I saw," noted Herbert. Frank Gibson, the only Bahamian who was rated on the FIDE list in the 1990s expressed satisfaction at returning to the prestigious list once again. The list is set to be released in October. Meanwhile Joseph, a junior at the College Of The Bahamas, said he appreciated the stiff competition and that it prepared him for the upcoming Junior Chess Championships, scheduled for a 10 a.m. start Saturday, August 26 at the CC Sweeting High School Auditorium. 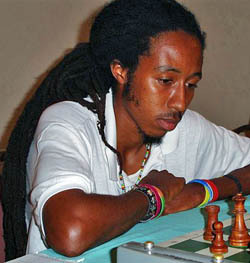 Malaku Lorne skipped Jamaica's National Championship to play in Bahamas' first FIDE event. Photo by Allan Herbert. Only the top-ranked players ranging between primary school and college are eligible and were invited to play. At least 24 players are set to compete and were selected based on their performances from two chess tournaments held earlier this year, the Individual Scholastic Tournament held in March and the Team Championships.